The December 2006 issue of the XTREME PSP Magazine is now available to download. Issue 18 is packed with over 90 pages of great content including previews of Dead Head Fred, Rainbow Six Vegas, Sonic Rivals and Chili Con Carnage. 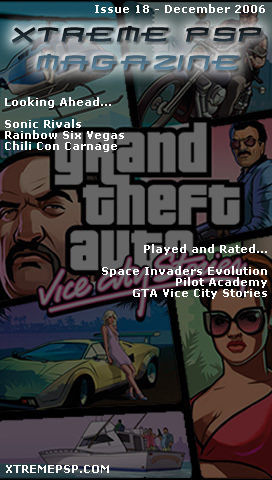 Plus reviews of SOCOM: Fireteam Bravo, GTA: Vice City Stories, Space Invaders Evolution and Pilot Academy. You will also find all the regular content including tips and cheats, the latest news, a competition, homebrew reviews and a feature on what to expect in 2007.
another great issue guys. keep up the good work and can wait for the new year issue. I had gone thru’ many PSP electronics magazines. We want issue 19 already?